Lightning is an unavoidable natural phenomenon which claims an average of 60 lives every year. We have lost nearly 630 lives in Karnataka in last 6 years, Considering this state government of Karnataka have launched an app called ‘Sidilu‘, means thunderstorms in regional language, which aims to provide location-specific early warning to prevent any loss of livestock in the region at a cost of 50 lakhs per year. 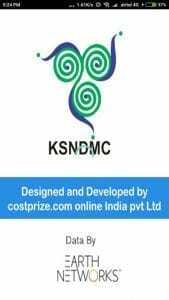 Karnataka State Natural Disaster Monitoring Centre (KSNDMC) has developed the application in association with U.S based firm Earth Networks, firm operates similar application in over 90 countries. KSNDMC have installed over 10 sensors in the region to track lightning and will issue the warnings to smartphone users 45min before the lightning strikes. Additionally, regions will be divided into four categories, alert in red will indicate that the user is in danger zone as there will be 90% probability of a lightning strike within a 1 sqkm radius of the location. Similarly, orange will denote possible occurrence of the strike within the 5 sqkm radius and yellow in 15 sqkm. If a green alert pops up on the screen, the user is safe. A thunderstorm, in general, has an impact area of 20 to 50 meters. “Each strike can carry a power up to 30,000-40,000 watts,” said a scientist. The accuracy of the alert is said to be for up to 200 m.
Above all, if you didn’t have any access to smartphone don’t get panic have a watch over your message box as the government have the database of around 28 lakh phone numbers of farmers and the public residing in rural and will send you notifications via messages or personal call. Interestingly, the app should have been launched a few months ago. But the delay in installation of censors deferred the launch. But, At last, the government made the use of infrastructure available at agricultural colleges and sensors have been set up.